KaraFun Help Centre Windows Offline Sync How do I save a playlist offline? How do I save a playlist offline? 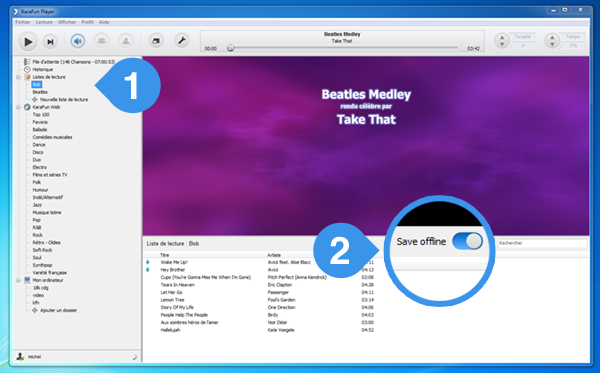 KaraFun Player allows you to save a playlist offline, so you can play karaoke songs even while offline. To do so, turn the "Offline" switch on, and make sure to wait a moment while KaraFun Player is synchronizing the tracks in the playlist on your computer. If you have a KaraFun Monthly Subscription or a Party Pass (2 days), you can download up to 1,000 tracks for offline playing. If you want to synchronize the entire catalog offline, then you’ll need the KaraFun Professional Subscription. Your playlist is only available on the computer you have used to create it. However, you can follow our tutorial on how to transfer your playlists between your computers.